The views were stunning. 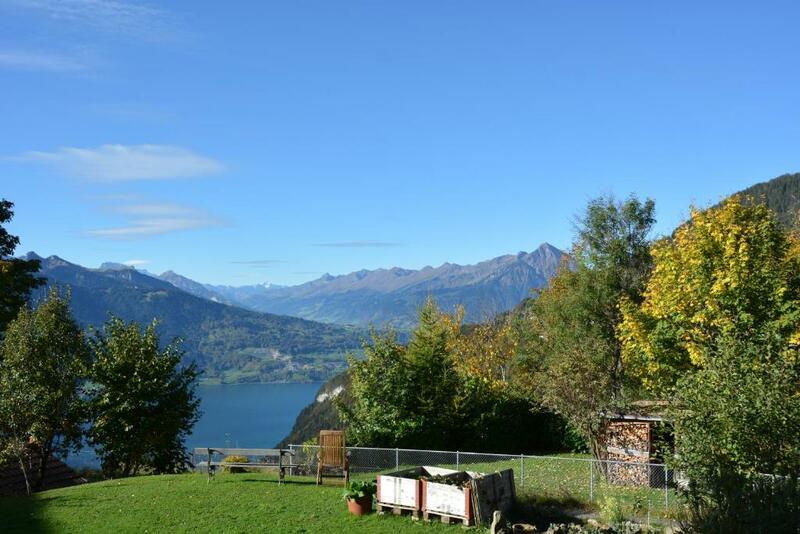 The location is fantastic for access to Interlaken and the surrounding areas. Ula was the most amazing host, and extremely helpful. Great location and super friendly owner. Apartment had everything we needed and our dogs loved the nearby trails. Excellent we had a wonderful time in ulas apartment felt like a real home away from home and Ula was wonderful and very helpful. Excellent location and nice apartment. Ula was helpful and she makes us feel like home. Thank you for everything. We travel with kids , the room is very well set for kids, also has great garden, it’s very kids fridendly apartment, Ula pick up from the bus station, and give us lots of travel information, the room is very clean, there are bbq set downstairs in the garden as well. We spent very nice time in ula’s Apartment. Will definitely stay there again next time. Ula is great host you feel like she is a member of your family. Every thing was organized and the apartment was so clean. We will stay again and again defenetly. Lovely interior and gardens. Ula the most gracious and helpful hostess. Complete kitchen, comfortable beds, wonderful stay! Lock in a great price for Ula's Holiday Apartments – rated 9.6 by recent guests! 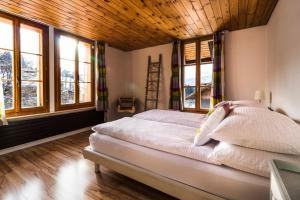 Ula's Holiday Apartments consist of 4 self-catering holiday apartments in a traditional chalet located in Beatenberg. Free WiFi access is available. The property is 1,300 feet from the ski elevators of Beatenberg-Boden and Waldegg-Hohwald. 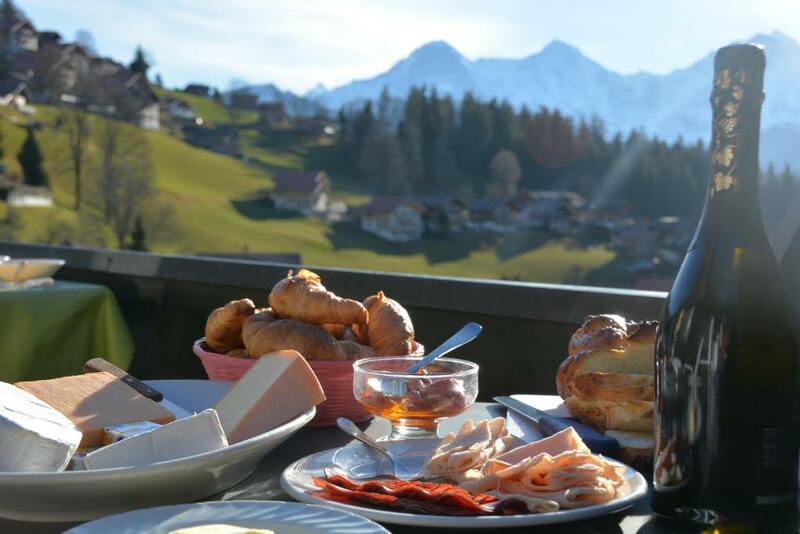 All apartments feature stunning views of the Eiger, Mönch and Jungfrau mountains. Most units have a terrace with lake views and a seating area. Each apartment is equipped with a full kitchen with a microwave and oven. Private bathrooms are fitted with a shower, hairdryer and free toiletries. Other facilities such as a communal coin-operated washing machine and dryer are provided. Activities in the surrounding area include skiing, cycling and hiking. The property offers free parking. The closest bus stop, Walddegg, is only a 1-minute walk away. Interlaken can be reached within a 10-minute drive. 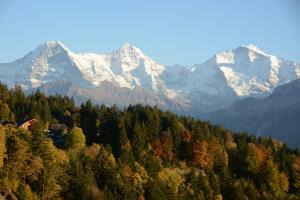 Schilthorn is 18 mi from the property. This property is also rated for the best value in Beatenberg! Guests are getting more for their money when compared to other properties in this city. When would you like to stay at Ula's Holiday Apartments? Set on the ground and first floor and accessible by stairs, this apartment with a garden terrace and panoramic lake and mountain views features a seating area with a flat-screen TV. The kitchen was renovated in 2016 and includes granite countertops, a glass ceramic stovetop, microwave and dining area. The private bathroom was also renovated and enlarged in 2016 and features a shower, hairdryer and free toiletries. Set on the ground and the first floor and accessible by stairs, this apartment with a garden terrace features a dining area, seating area with a flat-screen TV and a private entrance. The kitchen was renovated in 2016 and includes a granite countertop, glass ceramic stovetop, oven, refrigerator and microwave. The private bathroom is fitted with a shower, hairdryer and free toiletries. Set on the second floor and accessible by stairs, this apartment features a rooftop terrace with panoramic mountain and lake views, a kitchen with microwave and dishwasher, a seating area with flat-screen TV, and a bathroom with towels and free toiletries. The parquet flooring was renovated in 2016. Set on our first floor and accessible by stairs, this apartment features panoramic mountain and lake views, a dining area and seating area with flat-screen TV. The kitchen was renovated in 2018 and includes a granite counter top, glass ceramic ceramic stove top, oven, refrigerator and microwave. The private bathroom is fitted with a shower, hairdryer and free toiletries. 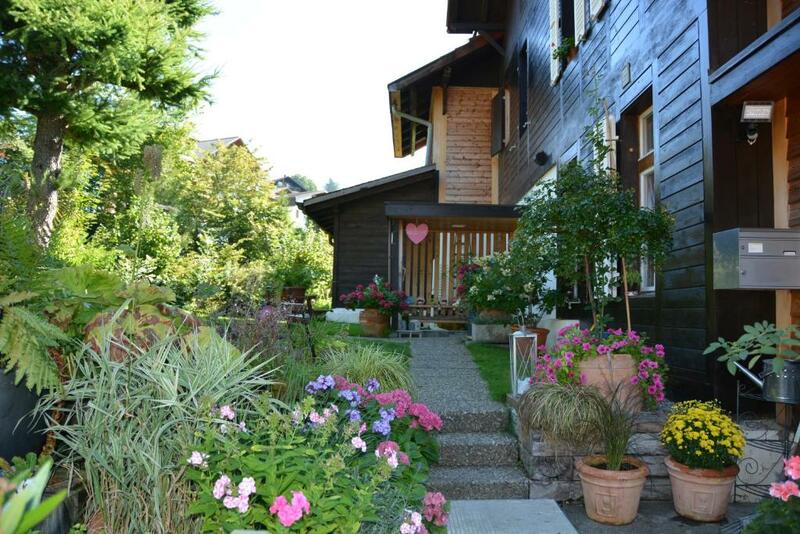 Ula's Holiday Apartments was originally built in 1866 as the Hotel Jungfrau one year after the main road from Interlaken to Beatenberg was constructed. Its location was specifically chosen because of the spectacular panoramic views of the Eiger, Mönch, Jungfrau and Lake of Thun. On a clear day, as many as 40 mountain peaks are visible from our home. 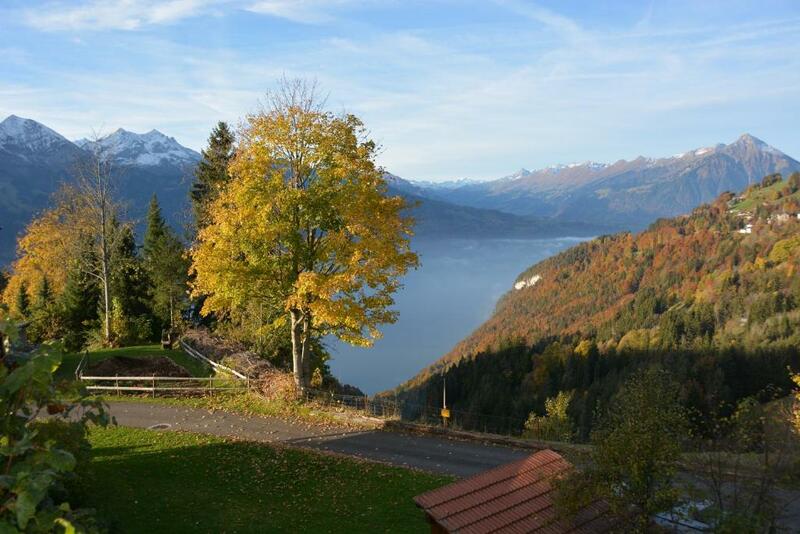 Being only 12 minutes drive from Interlaken or 20 minutes with public transportation, our guests benefit from a tranquil, Alpine setting with unsurpassed mountain and lake views, yet have close access to all the amenities of a world-renowned tourist resort. For those planning a holiday in the Interlaken region, Ula's Holiday Apartments offer a true Swiss Alpine village experience away from the tourist crowds, traffic and noise. After running a popular Hotel / B&B in Interlaken for over 10 years, I longed to return to my hometown of Beatenberg to be away from the mass tourism and have direct doorstep access to fantastic hiking, skiing, snowshoeing and nature in general. Being able to sit on my balcony listening to cowbells and enjoying the spectacular views is a dream come true. I have spent years traveling the world, visiting over 30 different countries as well as having worked abroad in Ireland and Australia. Not only has this given me a fantastic cultural education, it has made me appreciate even more the absolute splendor, peacefulness and life quality that living in Beatenberg provides. It is a pleasure to be able to share my home and love of this region to visitors from all over the globe. House Rules Ula's Holiday Apartments takes special requests – add in the next step! Ula&#39;s Holiday Apartments accepts these cards and reserves the right to temporarily hold an amount prior to arrival. Ula's Holiday Apartments accepts these cards and reserves the right to temporarily hold an amount prior to arrival. Please note that guests need to keep the kitchen tidy and wash all dishes before they leave. Please note that there is no elevator available in the building (only stairs). Please inform the property in case of late arrival. Please inform Ula's Holiday Apartments of your expected arrival time in advance. You can use the Special Requests box when booking, or contact the property directly using the contact details in your confirmation. Ula is a great host. She spent a lot of time to suggest us the place to visit. The view is superb. Ula is friendly and helpful. Pick up us and introduce some wonderful thing. This apartment is really clean and convenient, equipped with everything you need especially for family travels. The host Ula is very helpful, not only help us for taking the heavy luggage to the top floor but also very kindly to share advice or suggestions for our sightseeing in Switzerland. The bus tickets are very helpful for us to the center of Interlaken and back to apartment. We love all the things while in Switzerland, which is a highly civilized country with good sense of order and sequences. The apartment was very cosy and brightly decorated! Very clean, stylish and romantic! We had an amazing stay and there is a garage with roof available too! We highly recommend it! Excellent balcony overlooking a beautiful view. Full kitchen, host offered a camping bed and even brought it up and set it up for us while we were out enjoying the area. Ula gave great advice in activities in the area, restaurants, and suggested many things that myself and my friends enjoyed during our stay. She also showed us the nearest bus stop, which was less than a minute walk up the road and a perfect way to get around. An overall perfect experience here. Fantastic location as a base to explore the area. We had the smallest apartment but this in more than enough for 2 people. All items you need for making your stay comfortable are available. Very helpful host. Free bus rides so you can leave the car parked at the house. We will be back to spend more time in that wonderful region. Host drove to pick us from bus stop and even dropped us off at the bus stop! Very good host! Very clean, nice view, lovely host, ula and her husband who are very experienced.closed to a bus stop to Interlaken. Wonderful stay. The view from our apartment, the space and the taste in the design of every little detail in the apartment was awesome. The availability of Ula was outstanding. For every little request she was available. That our stay was not longer. Ula is one of the best hosts I have experienced on my travels. She went out of her way to ensure that we had a great stay and is super knowledgable about the region. The apartment was also exactly as the pictures suggest and more. We arrived by car and enjoyed covered parking but if you choose to arrive by bus from Interlaken, a there is a bus stop right next to the property.